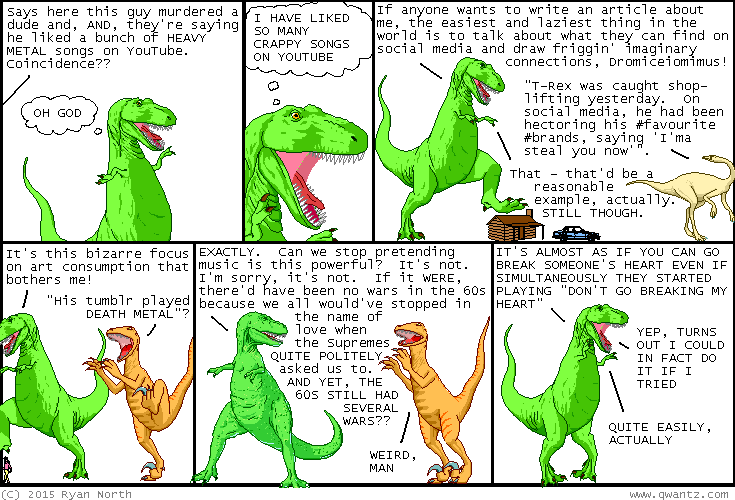 Dinosaur Comics - February 24th, 2015 - awesome fun times! –APPARENTLY, even Shakespeare himself used "they" this way! February 24th, 2015: If you read the SECRET TEXT for yesterday's comic (shhh, don't tell) you'll see there was references to the Jurassic Park theme slowed down 200, no wait 2000, no wait 20000 times. Here are YouTube videos of just such songs. The 20,000 one actually exceeds YouTube's length limits so instead it's just 15,151.51 times slower (Guilherme did the math, he is amazing) but STILL. Enjoy! Play them all at once for some reason and feel the madness crawl inside you!